Yes, that’s right, I’m writing a leadership lesson about roadkill. As I was driving to an event last night, I was very inspired by the poor animal who died prematurely. Projects are often killed prematurely, leaving quite a mess. Needless project death could be avoided by watching for a few warning signs. Watch for roadblocks. Our local interstate is undergoing some major construction. There are barriers dividing the east and westbound lanes. This is a trap for our unknowing wildlife friends, who think they can cross the street. They start across, see an oncoming car, and try to beeline it to the other side. Suddenly, they find themselves stuck between a barrier and a vehicle racing down the road at 80 mph. Project managers at times have a tendency to head down a path and don’t notice the project barriers until it’s too late. These barriers can be anything from unsecured funding to stakeholders consistently disagreeing on requirement interpretation to severe design constraints. These roadblocks can be identified and mitigated through detailed risk analysis sessions. Understand the road. I can’t tell you how many times I have wanted to explain to animals that if they would just learn to avoid the road, their deaths could be preventable. A lack of knowledge and understanding about the purpose of the road sends them across to an untimely death. More frequently than should occur, projects move forward into design and construction without enough planning, requirements, and true understanding of what the project is solving. In the project management world, the bulk of the work should be spent planning. More planning on the front saves time (and potential death) as the project progresses. Don’t let fear paralyze you. People overuse the colloquialism “deer in headlights,” but that is another significant killer of animals. When the animal sees its impending doom, it freezes in response. With projects, taking no action is probably the worst decision that can be made. Project managers need to know how to assess the situation and respond. Proper risk analysis and contingency planning all throughout the project can help make those decisions, so when the moment comes, there isn’t fear paralysis. While there are appropriate deaths to projects, unnecessary deaths can be avoided through understanding the environment, planning properly, and identifying risks early on. 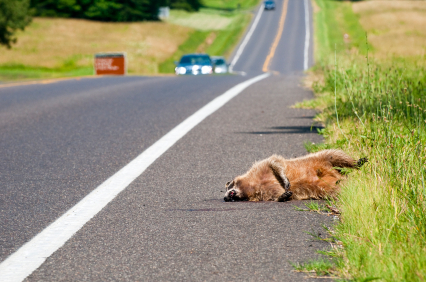 Don’t let your projects become roadkill on the highway of progress. Great article. The analogy works very well. Ha ha, thanks! Oh the places we find inspiration! But what about the rest of the story? What to do if you find your project a victim of death? Hopefully you can recover the vital pieces of the project in order to contribute to the success of another project. Sort of like organ donation. You’re right, I probably need to think through a post of what to do if you find yourself as road kill. Thanks for the suggestion!